If you were to take visitors on a tour of Beirut, where would you take them and what would you show them? Illustrator and designer Yasmine Darwiche leads viewers to Beirut landmarks and everyday scenes in the city with her refreshing debut exhibition at Tawlet restaurant. 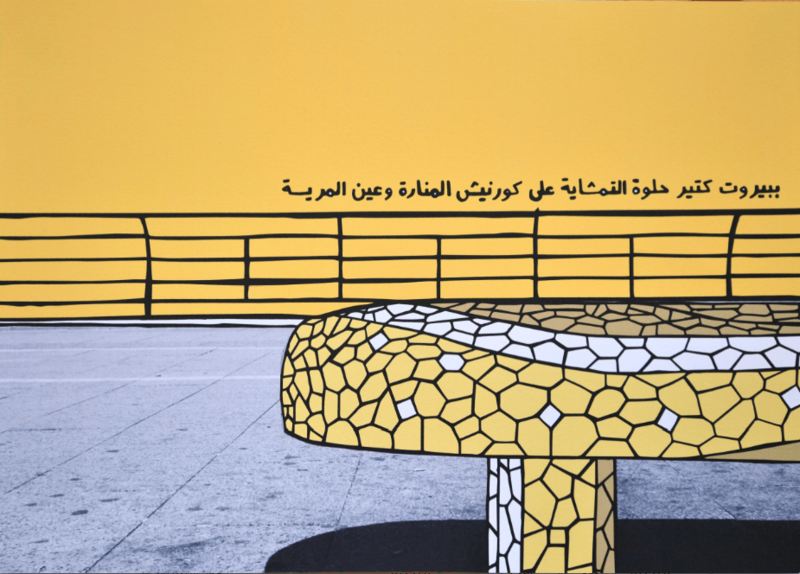 Through bright, simple but well-thought-out posters and postcards that merge photography, illustration, design and text, she tries to convey her love of Beirut to others. “I really wanted to do something personal. I love Beirut so I wanted to serve the community and have people see [the city]differently, to make it look lively and bright with all the colors. 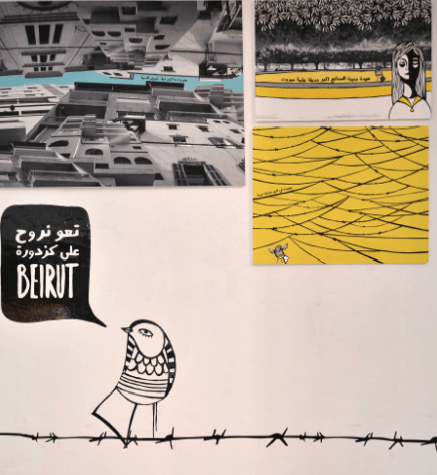 This is my contribution to Beirut – a tribute,” says the fresh graduate. The project actually began as part of Darwiche’s final year project at the Graphic Design department of the American University of Beirut. She took a month just to walk around the city finding her favorite places and things, then superimposed illustrations and graphically enhanced the images with color to create the final result. 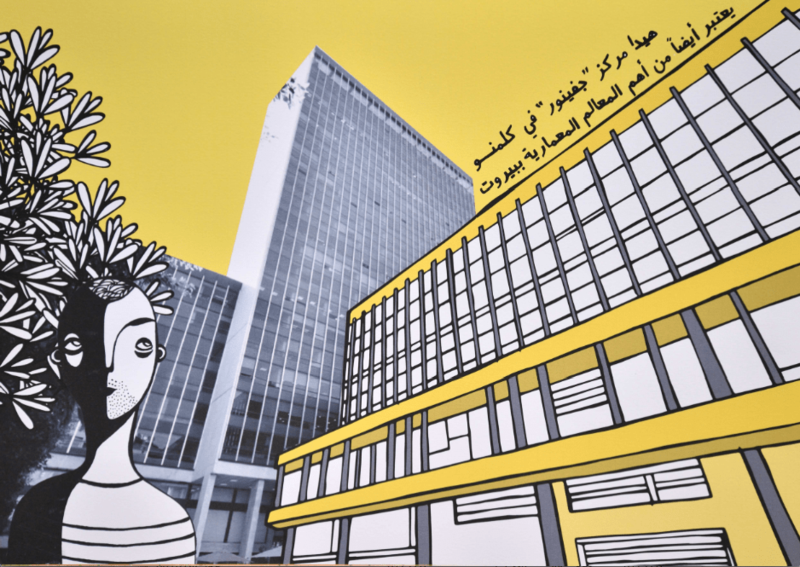 Dubbing the project a city guide of Beirut, Darwiche says she chose landmarks – like the towering, deserted war-emblem Burj el Murr and the modernist Electricité du Liban building – based on what they represent and their stories, adding that some of them are also really nice to draw. Other works depict Beirut’s infamous tangles of electricity wires and limited views of the sky in a witty and light way. “It’s taking the negative things about Beirut and turning them into something funny, things we can relate to,” she says. Darwiche explains that she first caught the eye of Tawlet owner Kamal Mouzawak when she did a series of illustrations depicting the restaurant, and he offered to host her work at the award-winning Lebanese eatery in Mar Mikhael, which is hosting more and more artists’ work in its space. The exhibition is ongoing through October and November.